Sci-Fi nerds rejoiced when Netflix released the third season of Black Mirror, Charlie Brooker’s tech-driven anthology series. Not only was the series the longest yet at six episodes, many of its episodes were the best the series had done. 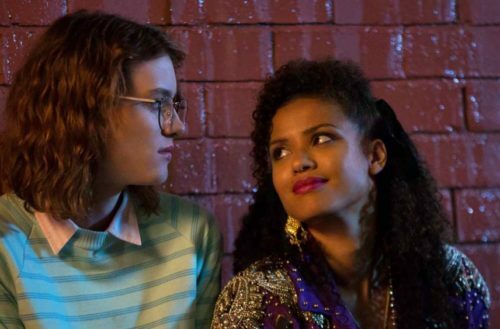 Most notable of the episodes was “San Junipero” — not just the best episode of Black Mirror, but one of the best episodes of television. The episode tells the story of a young woman who has her very first relationship after coming out as a lesbian to her parents. There’s much more to it than that — but if you’ve not seen the episode (and seriously you should), we don’t want to spoil it for you. The action takes place in the resort town of San Junipero across its many bars. If you’ve loved that episode as much as we did, get out your wallets. As part of the “Authors for Grenfell Tower” charity auction, you can bid on the sign from Tuckers, one of the bars in the episode. Unfortunately for American fans, they’re only willing to ship to the UK due to the sign’s size. As of this writing, the highest bid is £450 (or about $586), so it should bring in a sizable donation. While Americans have to miss out on this great bit of Black Mirror memorabilia, there are a number of auctions that will ship worldwide. All proceeds from the auction will go to to the British Red Cross’ London Fire Relief Fund. The money will go to help those affected by the Grenfell Tower fire on June 14. The Grenfell Tower was a 24-storey tower block of public housing; the fire started when a man’s refrigerator exploded. Unfortunately, due to the materials used for the building’s facade, the fire quickly spread, trapping many of the residents inside. At least 79 people have died, though recovery efforts have not concluded, so that number would likely rise. According to the New York Times, survivors of the fire claim the facade was installed to beautify the building at the request of wealthy neighbors. Local politicians also made the decision to use cheaper, flammable material. In 2014, when the facade was installed, county residents received a £100 tax refund. Had the politicians opted to use the fire-resistant material, it would have added only £5000 to the total cost. The Authors for Grenfell Tower auction ends at 8:00 p.m. BST, June 27.